In Vertical Features Remake, a playful parody of avant-garde theorising, academics argue about the work of Tulse Luper, Greenaway's best known and recurring fictional character, who is also featured in his trilogy The Tulse Luper Suitcases (2003). The Falls is divided into 92 biographies of people who have all been affected by the 'VUE', the Violent Unknown Event, a phenomenon in some way connected with birds and flying. Michael Nyman provided the score for both films. 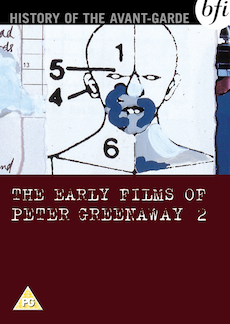 Filmed introductions to both films by Peter Greenaway. Galleries of artworks - contains material from 1975-1990. Archive materials - includes handwritten notes about The Falls and 'found' texts.